We all know how big celebrity weddings are. They wow us and really set the bar high in terms of wedding goals. Apart from them, we also like teleserye weddings where our favorite love teams tie the knot as part of the story line. Like real-life celebrity weddings, these unions have been great sources of kilig and wedding inspirations, too. This teleserye wedding is still fresh on everyone’s mind, since it took place just last month. And oh, we are certain that its influence on couple’s wedding inspiration boards won’t fade anytime soon. People still cannot move on with how lovely its venue was, thanks to Henry Pascual Event Stylist. What transpired after these lovers’ wedding wasn’t pleasant at all. Yet, we could not deny that their wedding was really full of stuff fairy tales are usually made of. Netizens also fell in love with Alayana’s bridal look, particularly her wedding dress that was created by Neric Beltran. Iris and Basti had to go through a lot of things, including crazy ones, before this wedding of theirs could push through. Besides their crazy love story, they also had to deal with some conflict between their parents that originated from many years ago. While things had not been easy for them from the very beginning, they still managed to fight for their love and got married eventually. Their story proved that love could really conquer all. 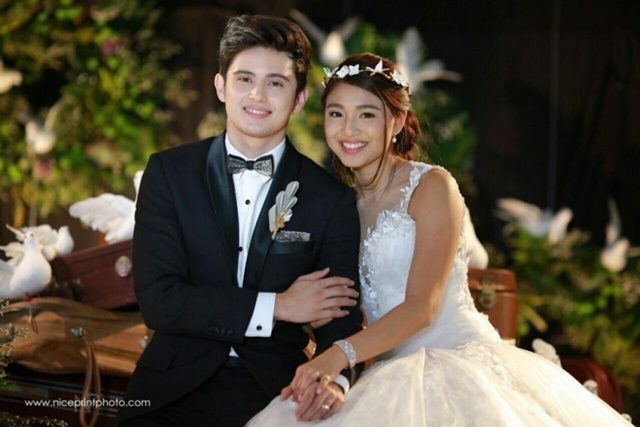 OTWOListas all over the world flooded the Internet with tweets when Clark and Leah finally tied the knot in the final episode of this romantic TV series. These fans were pretty understandable, of course. Besides JaDine’s chemistry, the story of the teleserye and how the two characters ended up together was also a great source of kilig. It’s already been over three years since this fairy tale wedding occurred but people still relive its memories. In fact, some netizens still post greetings for Maya and Sir Chief on their wedding anniversary. Sweet, right? What other teleserye weddings can you think of? Let us know by leaving a comment below!